Responding immediately to inquiries increases booking rates. Bookerville's Auto-Respond feature can put you on top. One of the best ways to increase bookings is to respond quickly to inquiries. 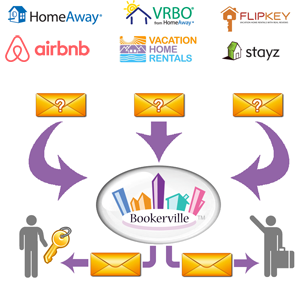 Bookerville can be configured to respond immediately and automatically to email inquiries sent by Homeaway, VRBO, FlipKey, AirBnB, HolidayLettings.com, and Stayz. Decide on Policy: Tell Bookerville to reply to both you and the guest, only to you, or not at all. Policy can be different for each listing site. Copy or Forward Inquiries: Send the email inquiries to Bookerville (see below for details). Bookerville is smart enough to direct the guest to your Bookerville availability & booking calendar with the guest contact information and requested dates pre-populated, to make their experience convenient, easy, and fast. If the requested dates are not available, they are still directed to your calendar so they can try different dates. Alternatively, you can also customize the email that is sent to the guest - simply direct them to contact you or click to your own website. Inquiry Auto-Responder: one of countless Bookerville time-savers! Oct. 22, 2014 Update: Bookerville's Auto-Responder now also works with AirBnB, Holiday Lettings, and Stayz!